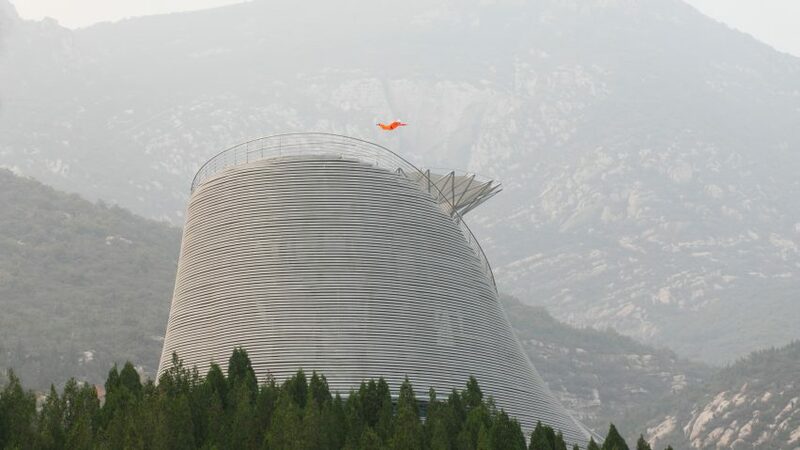 Monks perform levitation over a huge wind tunnel at this amphitheatre, which was designed by Latvian studio Mailītis Architects for a mountain range in central China. The Shaolin Flying Monks Theatre stands on a slope covered in cypress trees on Songshan Mountain – a mountain range in Henan Province. 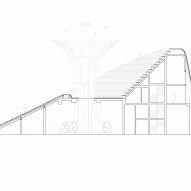 Tasked with creating an amphitheatre to host weekly shows where local monks as well as the general public can try flying, Riga-based Mailītis Architects wanted to create a building that respects its natural surroundings. The shape of the building is intended to finish the peak of the Cypress Hill, with the sloped outer shell forming a grand staircase that leads up and around the auditorium in the middle. The wind tunnel rises high in the centre, featuring a branch-like structure that splays outwards at the top. "The concept is to tell the history of Zen and Kung-Fu through artistic performances and the architectural image of the building itself," explained the architects. "The architectural and conceptual image pays respect to the beauty of surrounding nature and the historical heritage of the site," they continued. "Developed in the shape of two symbols – mountain and tree – it serves as a platform for any kind of scenic arts focusing especially on flying performances." A metal banister lines the side of the staircase around the rim of the structure. On the interior of the laser-cut steel structure, stone steps form seats facing the stage. "The building method combines modern and ancient technologies – a laser-cut steel superstructure supports stone steps handcrafted using local quarry resources," said the architects. In addition to the exterior surface and steps, and the inner stage, the theatre also features a three-storey interior space housing facilities for visitors and performers. The engine room of the wind tunnel is located below the stage, and is covered by a perforated surface used to intake air and eliminate sound. It is also insulated with acoustically insulating material on the inside. Technological devices, developed by wind tunnel-manufacturer Aerodium, are also stored here and create the air flow that goes straight to wind tunnel, which can be adjusted by the operator. Led by Austris Mailītis, Mailītis Architects is a family company comprising two generations of architects and artists. Other projects by the Riga-based team include a scaffolding and timber pavilion at Latvian brewery. Architects Austris Mailītis, Andra Odumāne and Reiji Kobayashi also worked with 13 students to design and build a temporary structure made from stacks of recycled material for a brewery. Photography is by Ansis Starks.